Little Independent & SoMe Upcoming Kickstarter Project! 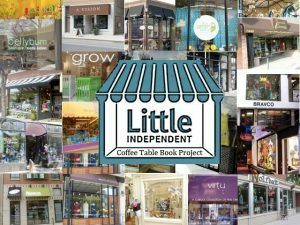 We’re excited to launch an upcoming Kickstarter project with Little Independent for a gorgeous and colorful coffee table book celebrating independent retailers on main street America. SoMe worked with Little Independent to consult and collaborate on this project and on a variety of phases, including, the copy and editorial, video, and will participate heavily in promoting the project via social media channels. We are so excited about our Kickstarter project which we’re planning on launching within the next two weeks. We’ve written our draft outline, figured out our reward levels and shot video at a bike shop, a boutique and a gift gallery. The project is to create a colorful coffee table book to highlight and promote mom and pop shops across America. We just have to upload the edited video and submit the project for review. Once it’s approved, we’ll go live. We’ll be sharing the link via e-mail, facebook and twitter and hope that you’ll help spread the word. Thanks so much and we’ll keep you posted! Little Independent is an online marketplace for sale items from independent retail stores. We feature Unique Stores & Great Sales and are a brick and mortar retailer’s alternative to Amazon. Special thanks to Aalap Shah of SoMe in Chicago for helping to coordinate this project. His expertise has been invaluable and he’s a great guy to work with. Check out SoMe at www.50.87.150.103/~someconn. I wanted to share the basic strategy and plan for getting your social media efforts up and running effectively. I’ll go thru it step-by-step to outline the important tasks. Your first step in creating a social media plan is to identify one person to be the primary source of content generation. This person should be responsible for collecting, distributing, and scheduling content. Choose this person wisely and don’t overload your front desk staff/servers/office manager with this task. Once you’ve identified your social media manager, your next step is to claim your account on Facebook, Twitter, and Google +. Next, create standard imagery for your business, make sure you have a high quality logo file, and craft verbiage that you can leverage on all social media platforms. All social media platforms have unique requirements for images size and number of characters, so keep this in mind when creating your profile information. (A quick google search will help you figure out the requirements). Make sure to use the same type of imagery and colors among your platforms to create trust and credibility for your customers. As you’re filling out the basic information for your business, make sure to use selected keywords to further optimize your presence and make it easier to appear for local searches on these platforms. For example, you may want to include “medical imaging” “italian restaurant” “doggy day-care” in your business description. Also, don’t forget to consistently use the brick and morter address as you’re claiming each profile (i.e. 441 N. XYZ Street vs. 441 North XYZ Street). Once everything is setup and filled out, take pictures of your business and your team so potential clients can get familiar with your business. Professional photos are highly recommended,however, don’t let that stop you from taking pictures from your camera and posting them in the short-term. Facebook: Behind the scenes photos of the chef’s creating our very first Raspberry Glazed Chocolate doughnuts! Google +: Join our “hangout” (video conference) and talk to our chefs about the best tips on making doughnuts at home! Twitter: Generally, I recommend between 4-6 posts daily on this network. Twitter is a real-time service and you want to catch your audience whenever they are logged in. Facebook: The standard posting schedule is about 2-3 times a week. Keep in mind that every facebook “like” is valuable as it allows you to reach your customers constantly. Google +: I recommend posting 2-3 times a week on this platform as well, not only because it’s a valuable search engine tool but a great way to leverage Google Places and the “Hangout” feature to reach more customers. As with any social media platform, don’t be overly promotional. Talk about your community, become a resource, provide useful tips, offer general service information, and information on your upcoming events. Do you support local community initiatives? Fundraise? This is all great content to share with your customers. You want to show off your business’ personality and social media is a great way to continue highlighting your business in the community.